Departed Germany between 1991 and 1992. 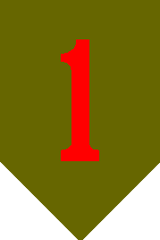 On 15 February 1996, the 3rd Infantry Division was reflagged in Germany as the 1st Infantry Division. The division had two brigades (2nd and 3rd) in Germany and 1st brigade at Fort Riley, Kansas. In July 2006 the division was withdrawn from Germany back to Fort Riley, Kansas; leaving only 2nd (Dagger) Brigade in Schweinfurt, Germany until 17 March 2008 when the 2nd (Dagger) Brigade reflagged as the 172nd Infantry Brigade.